Payday lenders find an unlikely supporter in Archbishop Welby! Now the tables have been turned on Archbishop Welby, one of the sternest critics of payday lenders as he is forced to make a u-turn on his position that payday lenders should be forced out of business. This blog will examine the comments of the Archbishop and explain why he has now changed his mind and come out in SUPPORT of payday lending! Wonga – a plague to modern society, or a helping hand in troubled times? It is a rare occurrence that a member of the clergy is moved enough about private enterprise issues that he makes a public statement on the subject. 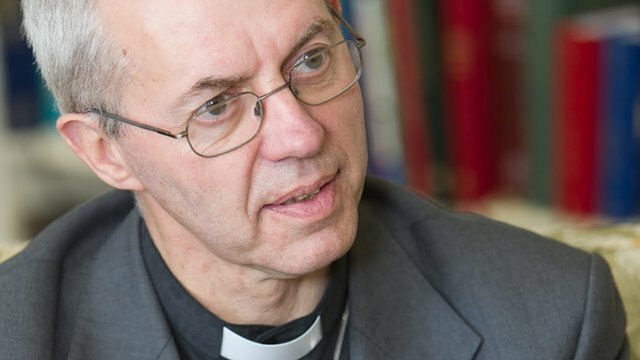 However, so controversial is the subject of payday lending that Archbishop Welby, a senior figure in the Church of England made a series of statements on the subject. His position was that payday lenders like like Wonga should be forced out of business and that they contributed to spiralling debt and as such were a something of a modern plague! He felt that poor people were being taken advantage of and should have greater protections in place against lenders who charge high interest rates. However, like many who weigh into the debates on payday lending, the Archbishop did not have all of his facts straight and he has now been forced to re-consider his position and retract his earlier statements, in favour of a more balanced approach which takes account of some of the advantages of using payday lenders, including the fact that although payday lenders can charge high interest rates, they provide a valuable service which keeps people from having to approach loan sharks who collect their repayments with violence and baseball bats. The Archbishop has now stated that forcing payday lenders out of business – something he advocated initially would have the consequence of forcing people into the hands of loan sharks who operate illegally. Research has indeed shown that the operation of loan sharks is on the rise. The change of position has been welcomes by the payday lending sector who feel they have been demonised and unfairly picked on as the cause of social problems like poverty and social problems related to poverty. However, what is obvious is that spiralling poverty in the UK is a more complex issue than one that can merely be attributed to the use of payday lenders. Increasing taxation, public spending cuts and the decline in funding for essential services like the NHS and foodbanks are more relevant to the issue of rising poverty in the UK. Payday lending, in fact has a number of hidden benefits for the poor which are rarely acknowledged, but which have been highlighted by the change of tune the Archbishop adopted recently on the subject of payday loans. Take the subject of food poverty. Payday loans help reduce and alleviate the consequences of food poverty. Food poverty is on the rise in the UK and it means a situation where a household is so stretched financially that there is not enough food in the house to provide basic nutrition to growing children and poor families. Dozens of payday loans are used to provide food for hungry children whose parents do not have to wait until payday for the money to provide basic nutrition to their children, thanks to the services payday lenders provide. In most cases the short term loans are repaid within weeks so families experiencing food poverty are grateful for the assistance they can provide in an emergency. Don’t criticise without thinking, why not ask users of payday lending services what they think? Fuel poverty is another issue, which the services of payday lenders can help alleviate. Fuel poverty, like food poverty, too in on the rise in the UK. It is where families and households across the UK are so stretched financially that they are forced to switch off the heat to save money. When there are freezing conditions and cold temperatures, despite ongoing fuel poverty, you can’t turn to the government for immediate assistance – the best they can do in most situations like this is give you a form to fill out, but what help is this when you want to put money on the gas meter? Payday lenders provide a useful service for struggling families in cases of financial emergencies, which mean that – no questions asked – money is made available so basics like heat and fuel can be purchased immediately. You might even say that the government should subsidise payday lenders, until they can effectively address food and fuel poverty. If you as poor people, they would agree!